Not so much a sermon as a meandering reflection on Christian attitudes to money, with possibly some over-sharing on my part. Earlier this week I had an epiphany; a sudden realisation about the way in which I live my life. So this morning you’re not so much getting a sermon as a meandering reflection on this revelation. In July we’re going to spend four services thinking about giving. Next week we’re going to look at giving our time and talents. The week after that, Paul and Warren Bartlett are going to talk about the work of Uniting World and what we as a church can give to our sisters and brothers overseas. And on the last Sunday in July the theme will be ‘giving ourselves’ and we’ll reflect on the ways in which we can offer friendship and support and kindness in an increasingly bleak and disconnected world. But today, the first of our ‘giving’ Sundays, we’re going to start with the big one. We’re going to talk about money. I answered that I could. I haven’t been here long enough to know about your marriages, and I really don’t want to know your individual giving patterns. But it is my job to hold up before you the opportunity to respond to Jesus’ teachings upon wealth. The Bible is blunt when it talks about money. The gospels are full of examples of Jesus’ care for the poor and warnings to the rich. Today’s parable, with its warning to those who store up treasures for themselves but are not rich towards God, is just one of many examples. Who can forget Jesus’ warnings: ‘woe to you who are rich, for you have received your consolation’ (Luke 6:24) and ‘It is easier for a camel to go through the eye of a needle than for someone who is rich to enter the kingdom of God’ (Mark 10:25); or his command ‘sell what you own, and give the money to the poor, and you will have treasure in heaven’ (Mark 10:21). This scriptural emphasis on the importance of cold hard cash in our spiritual lives is that reason that every Sunday, in the middle of our service of worship, we take out our wallets or purses, put money in a collection bowl, and then offer it to God with a prayer. As Jesus taught his disciples and the apostles taught the church, being Christian has implications for how we deal with our money. Budgets are moral documents. What we spend our money on shows what is important to us. Having an offering of money in the very middle of a service reminds us that how we deal with our money is a theological issue and that those of us with much are expected to share with those who have little. What might stop us from this sort of generous giving? The most obvious roadblock to giving is having little or nothing to give. We often misread the story of the widow’s mite in the gospels of Mark and Luke. Jesus sees a widow putting two small copper coins into the Temple treasury and tells his disciples: ‘Truly I tell you, this poor widow has put in more than all those who are contributing to the treasury. For all of them have contributed out of their abundance; but she out of her poverty has put in everything she had, all she had to live on.’ (Mark 12:43-44) We often read this as encouraging us to give everything we have to live on as our offering, which is impossible. But immediately before this, Jesus warns his disciples of the scribes, who ‘devour widows’ houses and for the sake of appearance say long prayers’. (Mark 12:40) The poor widow with her two copper coins has had everything she has devoured by the Temple system, and Jesus is condemning that. Remember, the one who had much did not have too much, and the one who had little did not have too little. Christianity does not ask the poor to give more than they can, and certainly not all they have to live on. But most of us in Australia are not poor. 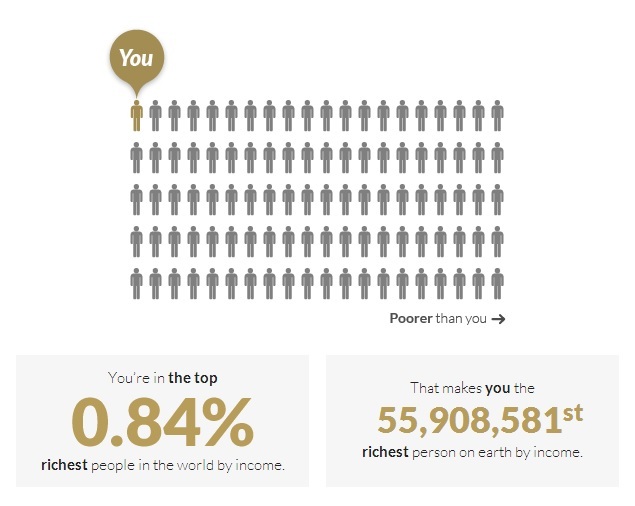 If you read my piece in this month’s newsletter, you’ll see that I’ve discovered that I’m among the richest 0.84% of people in the world. It could be that most Australians don’t give as much as we can because we just aren’t aware that we are well off, and as soon as we realise how financially comfortable we are, we give more. But I think there’s more to it than ignorance – and now I come to my epiphany. This week, as some of you will know, I spent a couple of days in Sydney for a church meeting. The Assembly had arranged for me to stay overnight in a hotel, but in the morning, when I went to check out, the hotel receptionist told me that the Assembly hadn’t arranged to pay for my room, and I would have to pay for it myself. I froze, and had a few moments of absolute panic. Then I turned for help to the other church people staying in the hotel for the meeting; we found that none of our rooms had been paid for; we asked the receptionist to ring the Assembly office; and it was all sorted out. We left and went on to the meeting. I wondered why I had been so scared. I didn’t have enough cash in my purse to pay, but I had enough in my bank account to enable me to pay by EFTPOS. And even if I hadn’t, I have a credit card issued to me by the church, which would have covered the charge until the Assembly reimbursed me, as I knew it would. So, why the fear? I’ve decided that the answer is that somewhere inside me, I am still the university student who lived below the poverty line. I don’t give as much as I could because I’m afraid that my money will run out. That was my epiphany; my attitude to money is governed by fear. I think that’s true of many, many Australians. We don’t give as generously as we could not because we don’t have the money to spare, but because we’re afraid that we don’t have the money to spare. Even if we have money now, something might happen, and we won’t have it tomorrow. We need income insurance, in case we can’t work; we need millions of dollars in superannuation for when we retire. Incidentally, I looked up what it’s recommended that Australians aim to have in superannuation and it’s $41,000 per annum for a single person. That’s what Australians are being told to aim for at a time when the aged pension is $21,020 per year for a single person and Newstart is $14,391 per year. No wonder Australians are worried about money, when we’re told that we must have twice the aged pension and almost three times the unemployment benefit to have a good standard of living. Today’s gospel reading challenges that mindset. ‘One’s life does not consist in the abundance of possessions’ and ‘God said to him, “You fool! This very night your life is being demanded of you. And the things you have prepared, whose will they be?”’ The Book of Proverbs says that ‘Whoever is kind to the poor lends to the Lord, and will be repaid in full’ (Proverbs 19:17) and that’s the way we’re called to live. It’s absolutely, utterly counter-cultural in this world of income insurance and superannuation, but it’s Christian. Willimon, who I quoted earlier, says that ‘if pastors are to be “examples to the flock” … then our stewardship, our financial commitment to the work of the congregation, ought to be exemplary’. Mine hasn’t been. Since I stopped being one of Australia’s poor and started earning enough to pay tax, I’ve always donated several thousand dollars a year to charities, but that’s come out of my post-tax income and has been at my discretion. This week’s epiphany, and all the reflection I’ve been doing on money, has challenged me. I’m not sure that I’m ready for my stewardship to be ‘exemplary’, as Willimon says it should, but at the very least I don’t want to provide a bad example to the flock so, once I check my calculations with Bev, I’ll be donating 10% of my pre-tax stipend by direct debit to this congregation’s finances for the next twelve months. And at the end of those twelve months, I’ll let you know whether and how this has affected my life. That’s my meandering reflection on my revelation. I hope that you’ve found my attempt to make sense of my own attitude to money and giving helpful. But in any case, I want to thank you for listening. William H. Willimon, Pastor: The Theology and Practice of Ordained Ministry, Nashville: Abingdon Press, 2002, p. 85. This entry was posted in Random Musings, Sermons and tagged giving, money, Sermon, tithing, Williamstown Uniting Church, Year of Luke. Bookmark the permalink. As far as I can see from my five months here, Williamstown is divided between the very wealthy who could give lots (but sadly are probably not in church to hear my words of wisdom); people on fixed incomes or moderate salaries who can give a bit, and maybe a little bit more than they are now; and people who live in the caravan park or the flats or in their cars and need the church to give to them rather than the other way round. I don’t want anyone who is on the books at Emergency Relief to feel they should give all they have to live on, no matter how the widow’s mite has been interpreted! This is good preaching – money is an issue that all too often we tiptoe around, instead of addressing it sensibly and with honesty. Thank you for your wise words and also for the sterling example you’re about to embark upon – I think I’ll print this to present to our sometimes over- zealous, unrealistic stewardship program convenor. Interesting read Avril – it’s given me much to muse on.